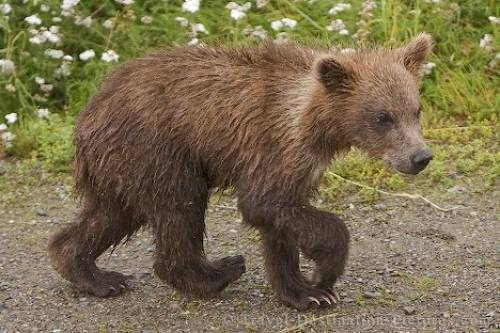 Small Cub Trotting Behind His Family in Katmai National Park, Alaska, USA. While watching the bears in Katmai NP a mother with 4 cubs came wandering just beneath the safe viewing platform. Sadfully it is not unusual that the male bears are killing and eating the cubs, especially if there are families as big as this one, so it was not expected for this cutie to survive the summer. Picture of a small bear cub following its family in the Katmai National Park, Alaska, USA.